Foodelicious: Zucchini Chutney, my long list of awards…and doubts..
Zucchini Chutney, my long list of awards…and doubts..
A few of my blogger friends had asked me to share what all do I cook with Zucchini. Friends, I do make a few things when I get Zucchini at a cheap rate here, but today I share an extremely tasty, spicy and tangy chutney with this quite tasteless Zucchini. I had experimented with this chutney a few years back but ever since then it has become our favorite. This chutney can be used with Dosa, Idli, snacks, as a side dish, as a spread …is quite a versatile one. One can make this in surplus and refrigerate it. I can eat it with anything except the sweets . The flavors added to the chutney completely camouflages the Zucchini so this Chutney is perfect for people who like/dislike it but surely can enjoy all it’s health benefits in this way!!! Heat about 2-3 tsp of oil in a pan and add fenugreek seeds, when they change colour (do not let them burn) add garlic and saute. I have used about a tea spoon of fenugreek as I love it’s flavour but one is free to reduce it as per their taste. Now add red chilies, zucchini, curry leaves, turmeric and salt. Mix, cover and cook till done. Cool the mix and transfer it to a grinder pot and add tamarind paste. Grind it. Temper the chutney with mustard and asafetida. Mix and refrigerate. Remove in small quantity when ever you use.. I also take the opportunity to wish my MOM and my dear friend Nalini G on their birthday today. Coming to the awards, first of all accept my apologies for the delay in accepting all these awards. Honestly speaking I was puzzled about the award thing. 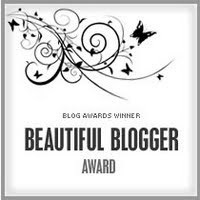 I truly appreciate my blogger friends feelings when they think of bestowing an award to my blog but I am surely puzzled and have my own doubts about them, do I deserve …? Am I an expert in cooking…? What have I really achieved..? I still feel I have a long way to go, a lot more to learn!!! 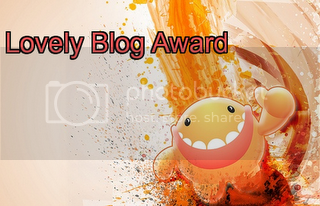 During the initial days of blogging my heart used to leap out every time I got an award. I remember so clearly the day I got my first award I had called up S and told him that I got a one… but during the course of blogging I realised that I am more satisfied when I read honest and genuine comments at my blog rather than getting awards. I am extremely happy when someone tells me what they liked in my recipe or why is the recipe different or what else I could do to improvise my recipe. I appreciate it more when my friends read my recipes or congratulate me when I try something new. In fact I do feel low at times when a good preparation goes unnoticed but I cheer myself saying what’s good for me may not be important to others…or they might know that and it’s not new for them. I get immense satisfaction in learning new things from so many talented bloggers and I am extremely glad if I can be of any help to my foodie friends, I genuinely try to answer all the queries that are asked here in my blog. Please do not get me wrong or feel offended..I do understand your feelings but for me my REAL AWARD IS WHEN I GET A COMMENT THAT SOMEONE TRIED MY RECIPE AND THEY ENJOYED MAKING AND EATING THAT or SOMEONE ASKS ME TO POST A RECIPE. I feel recognised and my work appreciated. I am truly truly humbled when people find my work honest and take out time to appreciate all the work and effort that goes in making a recipe as well as writing the post. So here I am accepting all the awards with utmost humility as I treasure my blogger friends and do not want to hurt you….. Thank you so much, I hope you will understand me …why I delayed!!! from Sanjana of KO Rasoi . 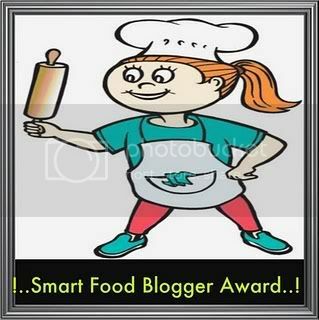 Nithu also shared the Smart food blogger award with me. I apologize in advance if I have missed out any. All the tags I have done earlier and you are welcome to read them in my previous posts. Please click awards in the navigation bar to read more about me. Congrats on all of your Awards, you are well deserved for all ! But true comment makes us more happy than anything else ! And about zucchini chatni- totally new will sure give it a try ! Had jus left u a comment here -did it go thru ? delicious chutney ,..ina market is so iterestin na,..will wait for ur couscous post,. Hi. Thanks Cicily for understanding. Kanchan thanks for keeping my morale up, glad to hear that. Vanilla, i got this comment, did u post a one earlier too? Thanks Sonia, this is my all time favorite. Does the chutney get its colour from red chillies??? Looks fiery hot. Yummy Zucchini chutney, great color.Enjoy all the awards. I am sending you another combo for your event shortly. 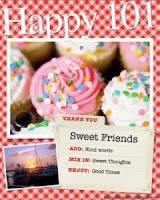 Thanks dear for remembering my birthday. And convey my birthday wishes to your Mom. I appreciate ur true and honest write up :) am sure many in the blogshpere feel the same :) but the beauty of blogging is that when one passes an award to another its just a way of letting u know that u and ur work are appreciated genuinely(doesnt matter if ur recipes are easy or complicated)! so sweetie cheer up! enjoy ur awards as u truly are a wonderful person!!! hey Pari, yummy chutney, and congrats for all your awards..wish your mom & friend a very happy birthday..
congrats on all ur awards.Keep rocking.the zuchinni chutney looks yummy. Nice writeup.I too agree with you. By the way i never heard of this chutney before.Thanks for sharing! Awesome chutney...and you are right, The real awards are when people complement you for your work, be it recipes or photography!Cheer up! Love to have it with dosa....congrats!!!!!!! Congrats on ur awards....Chutney looks creamy and yummy. Congrats on your awards. You deserve it for posting such great dishes. I will pick a recipe from your long list of posts and give you my true opinion, i promise! Congrats on all your awards...You deserve them. The chutney is very new to me....The color is very tempting...should try. Hey that looks absolutely tempting dear,,, I have bookmarked it to try immediately. Wow! What a colorful chutney! I love to try different varieties of chutneys and I have one waiting in my drafts. Well to come back to today's recipe..I wd'nt have thought abt Zucchini Chutney. Awesome idea and it looks great and love the color. Also I do try out recipes from my blogpals and so far have displayed couple of them in my blog..Will love to try out one of urs as well soon and keep checking my blog to see who's recipe I try out next..
Also I'm aware of ur 1st event and I'll def partiipate though I'm a bit of a procrastinator when it comes to these food events.. Happy Birthday to ur MOM...She must b so proud of you and ur beautiful work here...and did i forget to Congratulate you on ur awards..Well I just did. Chutney looks so tasty..loved d color..Congratulations on all awards dear! 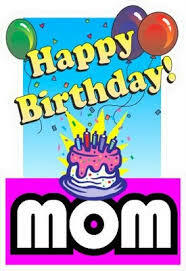 Many many happy returns of the day to your Mom and Frnd! Enjoy..
congrats on all ur well deserved awards! COngrats. The chutney looks nice and good one to hide zucchini without using it fully. True, comments are the real awards. I also feel the same way. getting an award is always a nice thing but when someone tries your recipe and lets you know that she liked it ...that kinda thing makes my day. chatni with juchini is a great idea and that looks absolutely great. mmm, chutney looks divine... I make zucchini chutney but my husband doesnt like it when he knows that zucchini is used so I really dont tell him what chutney it is but serve him.. Never used fenugreek seeds though but instead I use Channa dhal!!! Congrats on the awards!!! Very nice.I loved ur honestly and its not comment it is my regards. Truely I haven't taste zucchini in my life time so about your dish I don know what to write but If i make this dish in future then I promise I will come back to your this post and give you comment. WOw Pari, wat a colourful chutney, i do chutney with zucchini but not this colour, guess the chillies played an important role to this chutney, really looks spicy.. Tomorrow you will, as you put it in this post, your REAL AWARD. Yes, I tried one of your recipes and I was blown-off by the taste. Tomorrow I will be posting about it. See, people do try recipes from other blogs. Pari congrats on your awards dear :) Nice and different chutney...I've got to try this soon! Love the color of the zucchini chutney... looks delicious.. I agree w/ you on the fact that the real award is when someone really tries and appreciates ur recipe.. Wow..I Dont think it would even come to my mind to make chutney out of Zucchini! This looks so colorful and tasty....will definitely try this soon. zuchini chutney is something new and different,nice version and loved it colour too...and congraz on your awards pari.. I have not been blogging for very long...but I feel the same way...in fact I think I would like to show the appreciation for recipes like yours by dedicating certain posts to other bloggers' awesome recipes. So I will try your zucchini chutney and then blog my experiences with this lovely-looking dish, I think! Awesome looking chutney... Never bought Zucchini in my lif, coz I didnt know how it wud taste.. But time has come to experiment..! Congrats on the awards dear...! Hi Jayashre, The chutney is not very hot but gets it's colour from the red chilies. Thanks Suparna for your honest reply, I am so glad that people have heard my feelings. Vrinda, Nithya thanks for understanding. I agree it's upsetting when somebody who does not even visit u for ages suddenly drops an award. Rohini it's time u grab a Zucchini and try this, I promise u will fall in love with this chutney. 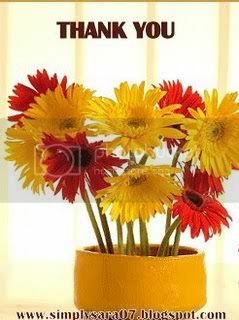 Meena, all the best with ur new venture girl. All the best. Priya, try red chilies next time, the color is exciting enough. Ramya will try adding chana dal next time. Cool Lassie, that's so sweet of u dear, I am waiting to read ur post and equally curious to know what did u try. 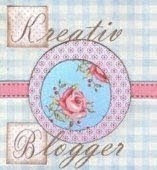 Thanks Vaishali that u visited here, liked ur blog. Subhashini, thanx for such a touching comment dear. Do try Zucchini now. Hey Pari, I couldn't agree with you more about the awards and totally understand your feelings :-) Congrats !! The chutney is lovely..and I never knew you could make chutney out of it.Lovely color!The idea is very innovative!Congrats on the awards. Zuchini in a chutney - truly genius!! i would never have thought about it!!. It is not one of my fav vegetable but the chutney looks so good and cant wait to eat it with my ghee dosai!. Cool Lassie thanks for that beautiful award, I am so glad you liked my preparation. Nandini make this and u will ask for more Zucchini. Gulmohar, Bedagi chilies are a kind of red chilies which are not very hot unlike the Guntur chilies which are very hot. Looks different recipe out of zuchchini amazing, i will try this recipe. hey the chutney looks so goood..Love the step by step presentation..
Congrats on your awards..All well deserved..Happy Birthday to your mom..
wow! congrats on all the awards! Got the comment Pari, no worries. Never tried chutney with zucchini..Lovely colorful chutney.. Awards are fun and important to some as a means of acknowledging someone's talent and efforts. However, I absolutely positively agree with you about the awards activity. I love to see people enjoy my recipes, to send me personal emails telling me of their experience, to post a sincere comment on my blog. You have a wonderful blog, well written, with mouthwatering photography. I am always happy to come here and see what's cooking and to learn something new. You have a kind and generous heart and it shows in your cooking! Congrats on all your very well deserved awards, i totally agree with u, it gives immense satisfaction and pleasure when someone tries your recipe and reverts back, makes my day :) Zucchini chutney looks yumm! That chutney looks so wonderful n yumm! Congrats on those awards!! hi pari, what a fantastic looking chutney!